Bread Fruit is a very well known veggie all over the world. I never knew that Bread fruit is available everywhere until I saw a pile in a Canadian grocery shop. I was so surprised and so happy when I saw it because I am a big fan of Bread fruit. It is popularly called as ಬೇರು ಹಲಸು/ ಸೀಮೆ ಹಲಸು / ದೀವ್ ಹಲಸು in Karnataka. It belongs to Jack fruit family. 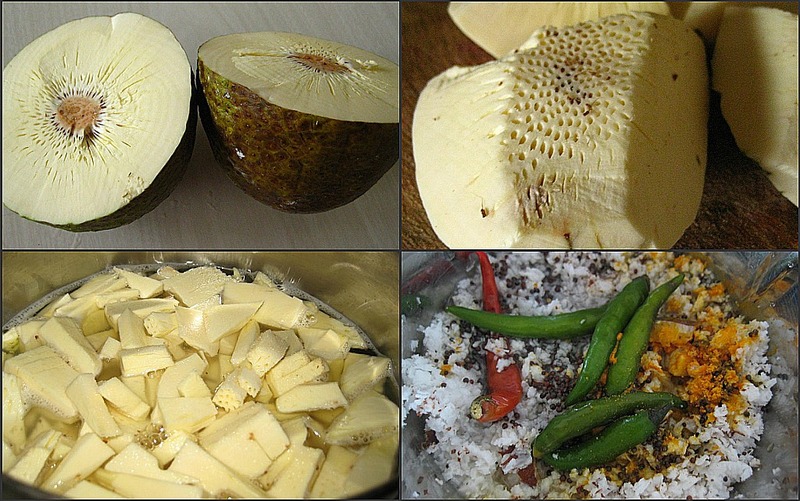 There are lots of dishes that can be using this veggie. What I am sharing here is a very simple and different style( you will know as you go through the method) Butter Milk Curry. Try it out and let me know how you liked it. Cut the bread fruit in to 4 pieces, peel off . Then remove the middle hard part as you see in the pic. Then cut into small pieces. Take about 1 1/4 lt of Water and the Bread fruit in a pan, add some salt. Then cook for 10 min (till the pieces are soft). Once it is cooked, take out the excess water and keep it aside. Then gently mash the Bread fruit with the help of a laddle as you see in the pic. Then pour back excess water which is kept aside. In the mean while finely grind the Coconut, Mustard seed, Turmeric and green Chilies using some water. Pour the ground mixture to mashed mixture. Add about 3 cups water ( consistency is your choice, you can use water to adjust the consistency). Adjust the salt. Then bring to boil for about 3-4 min on a medium heat. Keep stirring because it easily sticks to bottom of the pan. Now add the butter Milk and again bring to boil. Temper with Mustard seeds, Curry leaves and Hing. 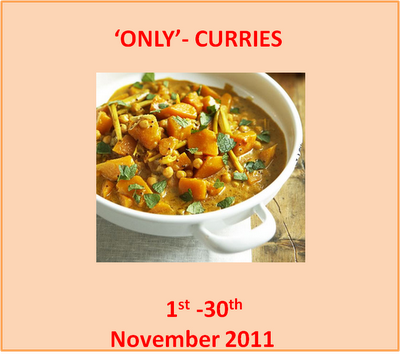 Sending this post to ''Only Curries'' event and Pari's 'Only'- Curries giveaway page. almost all your recipes are unique and wonderful...love this curry too looks so inviting! !